....Dugan opts out for Gloria Deputy Attorney General and Minister for Justice, Ms. Gloria Akuffo's, chances of getting the nod as the New Patriotic Party (NPP) candidate for the Shai/Osudoku constituency in the December parliamentary elections received a boost last Friday when one of her opponents opted out to rally support for her. Mr. Daniel Dugan, one of the major contenders vying for the right to be elected to represent the party, told The Chronicle he was quitting the race to rally support for the deputy minister. Dugan who denied selling out said, "I am opting out to support Gloria not because I find myself to be a weaker candidate, but I believe she will do a better work in Parliament." He stressed the need to support one candidate as a means of promoting unity in the NPP, which has been divided in the area. The constituency featured prominently in the media during the last quarter of 2003 not because of the personalities that are competing for the party's parliamentary ticket, but for the war of words between the District Chief Executive (DCE), K. T. K Agban and his niece, Ms. Akuffo. It is alleged that the DCE who also has his eyes on the party's ticket, manipulated some polling agents to insist that Ms. Akuffo, Dugan and one Samuel Ayitey, were unknown figures in the constituency and therefore should have been disqualified. 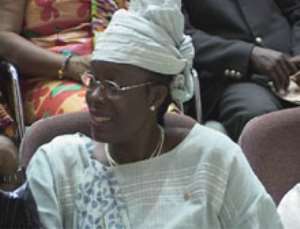 However, Dugan said opting out in support of Ms Akuffo would help increase the number of women in the next Parliament. "I have asked my supporters to rally behind Gloria," he said, " and I believe with that, she now has a strong backing from the delegates." Dugan observed. "She is more disposed, as a government figure, to wrestle the seat from the incumbent MP, Mike Gizo, than myself and Mr. Ayitey and as for the DCE, he has no good rapport with the people of the constituency," he said, adding that to allow the DCE to compete with Gizo, who is a level headed person, would be disastrous for the NPP. Ms. Akuffo told The Chronicle that Dugan's move was welcome as it added to her chances of getting the approval of the majority of the delegates at the primaries. She said, "Dugan and I have discussed the matter and I confirm that he has agreed to step down." Asked whether she was worried by the allegation that she was a stranger in the area, Ms. Akuffo said, even though there were publications, which stated that she was not qualified to run, because she was not a registered member of the party, nobody raised any formal objection when she filed her application at the constituency. Meanwhile, new date for the primaries is yet to be fixed following the postponement of last Saturday's date.